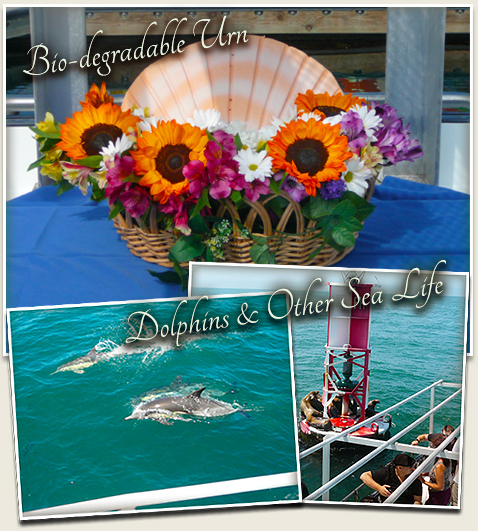 Free biodegradable seashell urn on this burial service package. Up to 50 guests are taken 3 miles outside the Channel Islands Harbor for the service aboard the Sunfish, then an option to take you on a memorable cruise afterwards is included. Total time can be as little as 1 hour or for the same package we can offer a mini cruise afterwards that would be an additional 2 hours. We take you to where the sea lions play and give you a scenic coastal cruise. This really helps to bring closure while you celebrate ones life and connect with the peaceful sea. The package includes flowers for sprinkling in the water and seashell biodegradable urn. We put the ashes into the urn so your loved ones ashes are not compromised. 2008-2019 © A&M Events presents: Neptune Burials at Sea. "It was a perfect when we took Charlie out to sea, and you all made it so... with your attentiveness to every wish Thank you a perfect culmination to a 57 year romance." "Captain Andy we wanted to thank you for the wonderful cruise after our sisters service this really made it so memorable .We will always treasure her special place you call Dolphins Way i know my sister is at peace now." "Michelle, Andy and Mike Thank you for a beautiful sending off of our Father. The pelican landing on the boat during the service seemed amazing as it was our fathers love to watch them fly overhead when he was sailing."